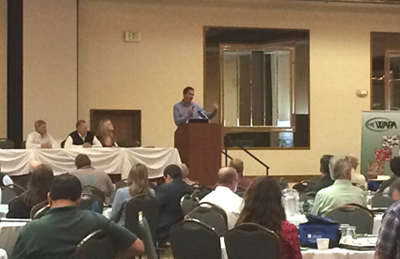 Over 200 people participated in the Ag Energy Consumers Association (AECA) and Western Agricultural Processors Association (WAPA) "Agricultural Renewable Energy Conference" held in Fresno this past week. WAPA President/CEO and current AECA Board President Roger Isom kicked off the event by stating "the time will never be better for renewable energy". Two panels of speakers were held at the event, including one on solar energy and one on biogas energy. Two WAPA Members were highlighted and spoke at the event, including Brad Craven from Superior Hulling speaking on solar energy and Russ Lester of Dixon Ridge Farms presenting information on their gasification project utilizing walnut shells. Also speaking at the event was California Cotton Growers Association board member Gary Martin of D.T. Locke Ranch. Several other speakers provided critical information on the latest information on solar and biogas including WAPA Associate Member Kevin Flanagan of Thinkwire Energy Services. 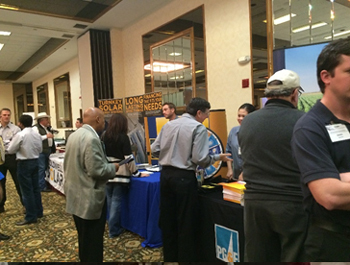 The event included a trade show with representatives from more than 15 different energy companies and utilities in attendance. The event was sponsored by lunch sponsors PG&E and Coldwell Solar, breakfast sponsors CalCom Solar and Conergy, and by Bag Sponsor Southern California Edison. A huge thanks goes out to these companies and all of the vendors who made this event possible. Copies of the presentations will be online soon at www.agprocessors.org.